Plesk released it’s new update Plesk Onyx 17.8. 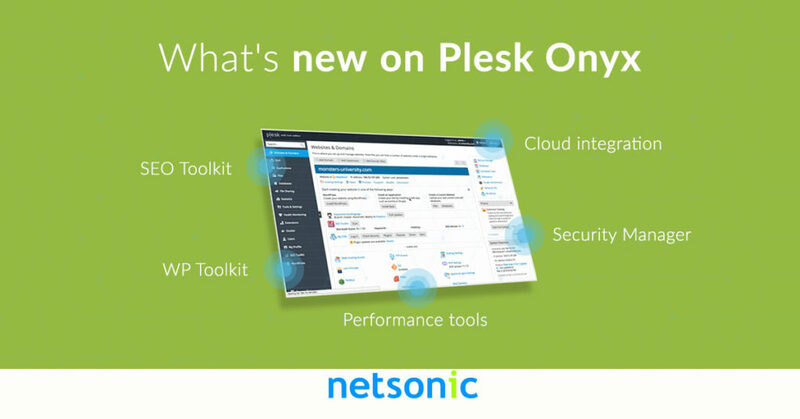 What does the new Plesk Onyx upgrade mean for it’s new and existing customers? It means an easier user experience for both new and existing users, tools and updates to tools to help your website reach it’s full potential, and upgrades to make sure your website is both safe and secure. Advisor will help you keep up to date on best practices for the security and performance of your server and hosted websites. Automatically scans your server and hosted websites for security and performance problems that require your attention and lets you know about the problems. Advisor give recommendations of how to fix the security ad performance problems it alerts you to. Having a SSL certificate on your website is going to be increasingly important. The Plesk Onyx 17.8 update is going to make getting a SSL certificate easier. SSL certificates can be added to all new domains, add-on domains, and subdomains. You can secure your mail server and webmail with SSL/TSL certificates. Nginx Caching reduces your website’s response time and server load. Caching allows certain types of PHP pages to be served to visitors as quickly as they could get static pages. By serving pages from cache the system load can be significantly reduced. Plesk Onyx 17.8’s new update brings exclusive WordPress toolkit features that are only available in this update. Faster and more focused WordPress Toolkit experience because of an improved and better looking interface. Smart updates allow a machine learning-based AI scans your website to see if any new WordPress updates are going to break something. Configure caching for WordPress instance easily. With so much content on the web now a days it’s important to make sure your SEO strategy is the best it can be, and you’re using SEO best practices. The Plesk Onyx 17.8 update has everything you might need in it’s SEO toolkit. The SEO toolkit does a content audit on your website and analyzes it, to see what common SEO issues your site might have. Gives suggestions based off of SEO best practices to fix any issues your website has. Allows you to see a log of search engine crawlers that have been at your site. Monitors your competitor’s keyword rankings. Deploy website content by pushing it to local Git repository or by pulling from a remote one. Create a multiple branches in a signal repository. Domain Name System Security Extensions or better know as DNSSE helps to make the internet a safer and more secure place. DNSSEC support allows users to protect data of hosted domains with DNSSEC extensions. Configuring the settings for user key generation and rollover. Sign and unsign domain zones to DNSSEC specifications. Receive notifications related to DNSSEC keys and records. Copy and view DNSKEY resource record sets and DS resource records. This article overviews and highlights some of the new upgrades and feature that Plesk Onyx 17.8 offers. You can always read in depth on Plesk’s website what the new Plesk upgrade offers. Want To Upgrade To Plesk Onyx 17.8? Would you like your Plesk instance and OS upgraded to Plesk Onyx Version 17.8? Email sales@netsonic.net and we will get this 1-2 hour admin process scheduled for you.